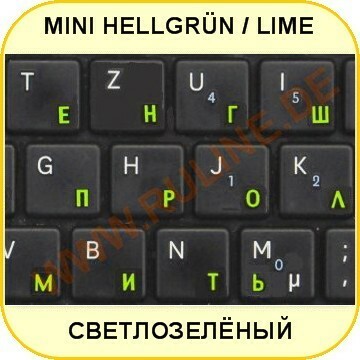 LAMINATED MINI-KEYBOARD-STICKERS WITH CYRILLIC / RUSSIAN LETTERS for all computers and computer keyboards in light-green on black! Mini Keyboard Stickers with Cyrillic / Russian letters for all PCs - keyboards in light-green with laminate protection and three-year full warranty. 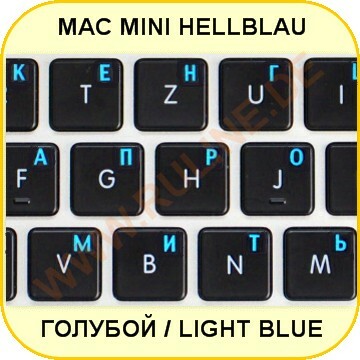 Unique laminated Mini Keyboard Stickers with Russian letters for all kinds of black computer keyboard. Mini Keyboard Stickers with Russian letters 5x5 mm fit for all computer keyboards and all kinds of notebooks, netbooks, ultrabooks, including all external mini keyboards for iPads, iPods, iPhone and all tablets. The stickers are made of a special, black film, printed with an exclusive indelible, UV-curable ink, and laminated with an additional protective sheet. All this allows to use the mini-keyboard stickers long term. We give these keyboard stickers with protective laminate three-year warranty for wear of color letters. Thanks to the small size, it is possible to position the letters to any site of key on the keyboard, they do not interfere with typing and do not move. The variety of colors is to be had for everyone. This black keyboard stickers with orange russian letters are especially suited for black computer keyboards. If necessary you can easily remove the keyboard stickers from the keyboard (removable). Look at the photo gallery after (down the page), as elegant and stylish look this black sticker with yellow letters which are genuinely "Made in Germany" on the keyboard!.